What is L’Oreal Revitalift Volume Filler Night Cream? Beauty and youth restored overnight — that’s the promise of L’Oreal Paris Revitalift Volume Filler Night Cream. It replenishes your skin’s lost moisture and relieves it from dryness by flooding your skin with hyaluronic acid which, as you age, your skin produces less of. With low levels of hyaluronic acid, your skin not only appears drier, it also looks aged, loose and saggy. Skin that needs a noticeable lift and volume is skin that needs L’Oreal Paris Revitalift Volume Filler Night Cream. Primarily made of hyaluronic acid and Alpina Galanga leaf extract, this anti-aging product is all about adding density and plumpness to your skin. What are the Ingredients in L’Oreal Revitalift Volume Filler Night Cream? 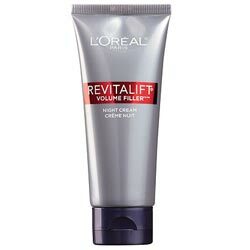 Apply L’Oreal Paris Revitalift Volume Filler Night Cream as part of your evening beauty regimen. Generously spread the product on your face and neck with a gentle massage and upward strokes to ease in the product for faster absorption and better assimilation into your skin. For best results, use with other L’Oreal products in the Revitalift line. L’Oreal Paris Revitalift Volume Filler Night Cream may have very limited ingredients which may not fulfill your skin needs. You should get more than enough. So if not this product, consider some other product that better addresses your skin’s requirements.